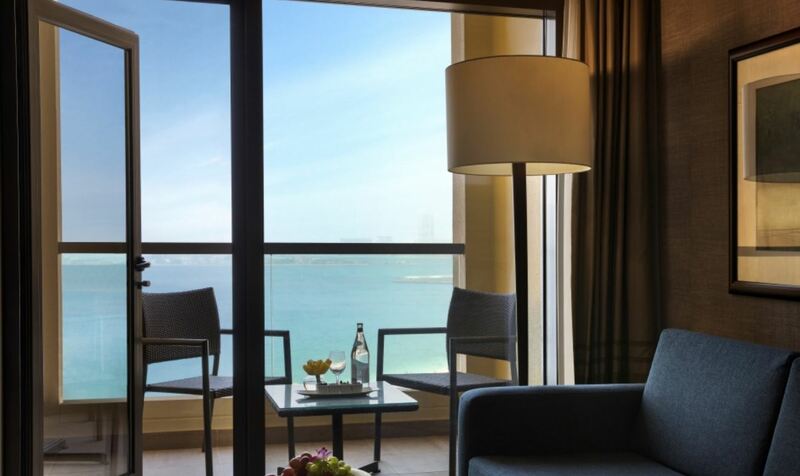 Located just a stone's throw from the famous restaurant and shopping strip known as "The Walk"
To experience the height of luxurious comfort, look no further than Amwaj Rotana. 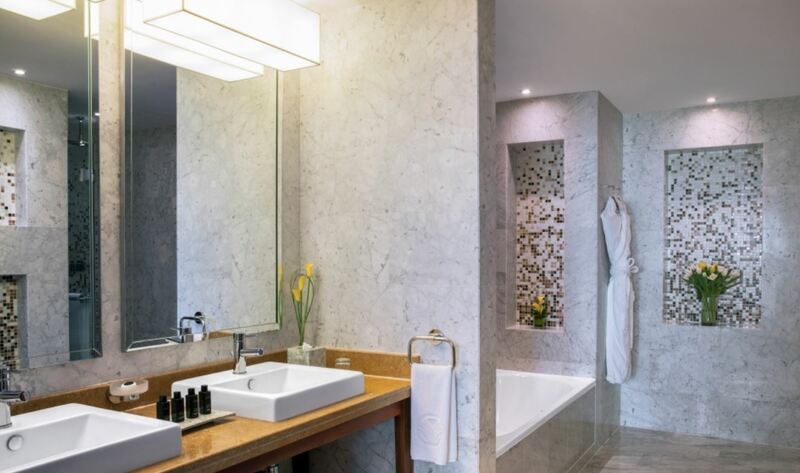 As part of the Jumeirah Beach Residence (JBR) complex, this spectacular Dubai hotel is located just a stone's throw from the Arabian Gulf, alongside the famous restaurant and shopping strip known as, "The Walk". 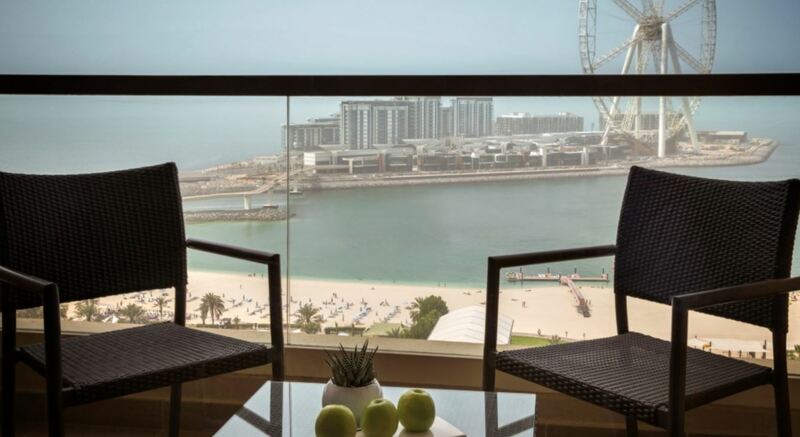 An idyllic retreat for memorable leisure holidays by the sea, accommodations are typical of luxury hotels Dubai - spacious with generous amenities, including LCD TV, high speed internet access, fully-stocked mini bar replenished daily, and complimentary tea and coffee making facilities. If and when you can separate yourself from all the luxury, there's Dubai to explore. A modern metropolis famed for its extravagance, Dubai has a plentiful supply of world-class attractions to fill your time, such as the world's tallest building, the Burj Khalifa; the world's most iconic man-made island, The Palm Island; and the world's largest shopping mall, The Dubai Mall. 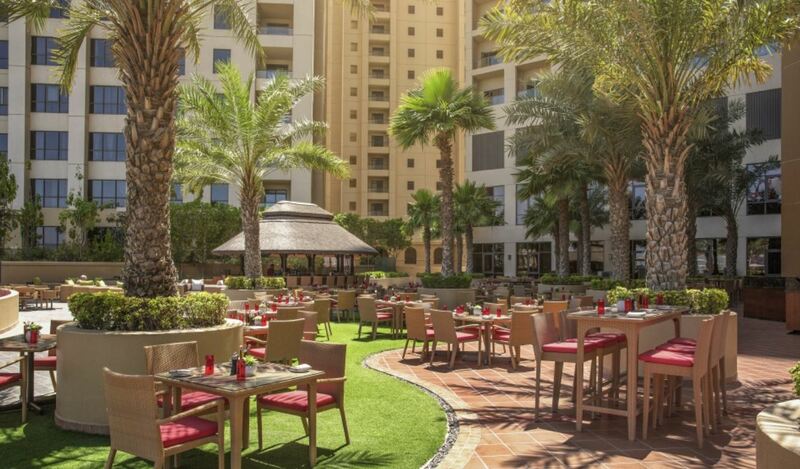 Amwaj Rotana hosts a number of onsite facilities including: Horizon - an all-day dining venue which presents a choice of international cuisine; Atrium - a lobby lounge offering a selection of light snacks; Rosso - an Italian restaurant; Benihana - an American Japanese restaurant and sushi bar; Sundeck - a pool bar and terrace; Bodylines leisure and fitness club, a wellness centre, and an outdoor swimming pool. 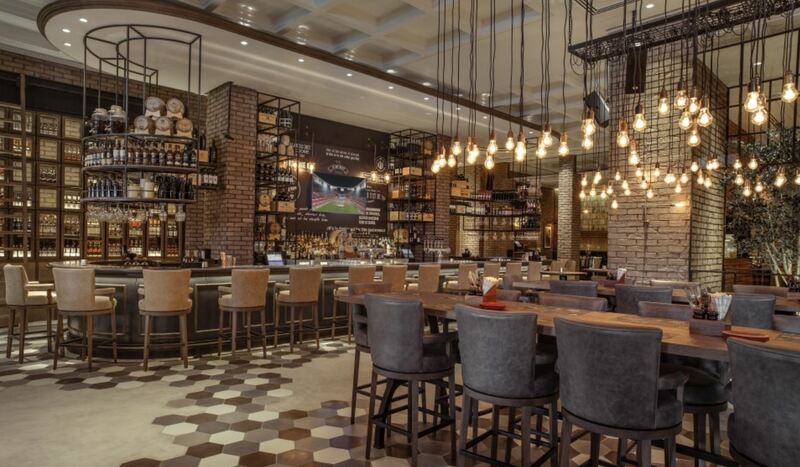 Offering three restaurants, guests at this Dubai hotel can not only enjoy the best of Italian, Japanese and international cuisine, but also expect live entertainment, happy hours, theme nights and more, to add that extra touch of fun to their stay. 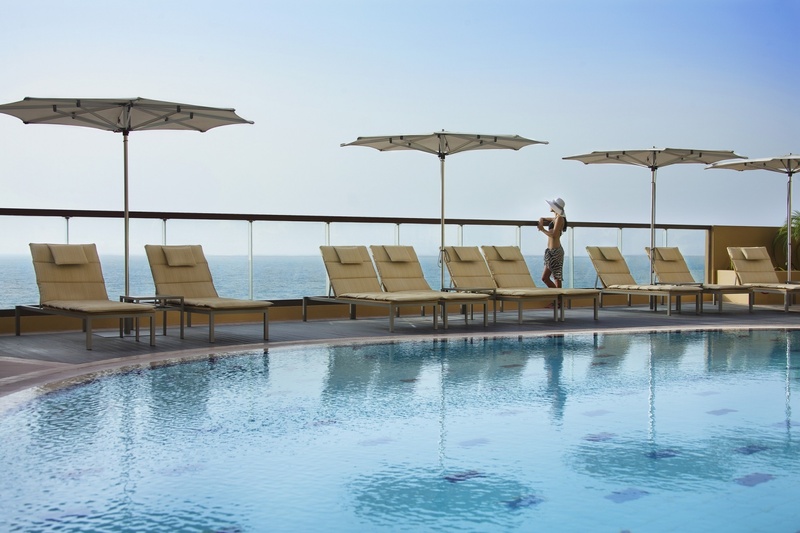 You can keep fit and relax with Amwaj Rotana's state-of-the-art facilities. The fully-equipped Bodylines leisure and fitness club is perfect if you want to keep up with your fitness regime during your stay. 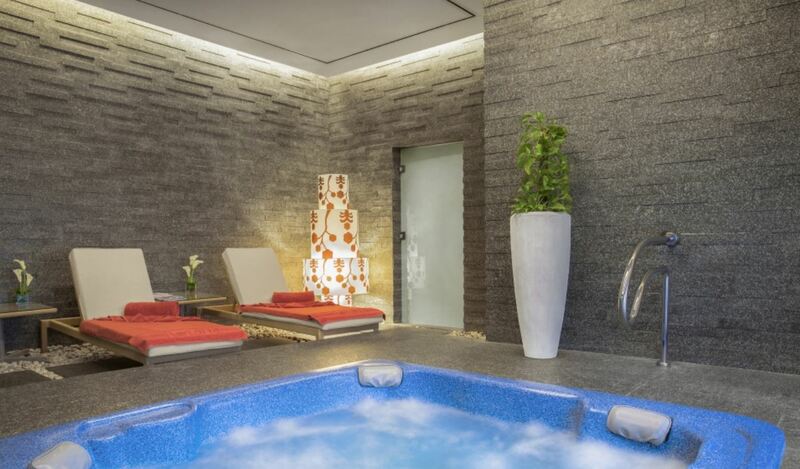 Then there's the wellness centre, which includes massage, sauna, Jacuzzi, and steam rooms, as well as an outdoor temperature-controlled swimming pool, and a kids' pool. 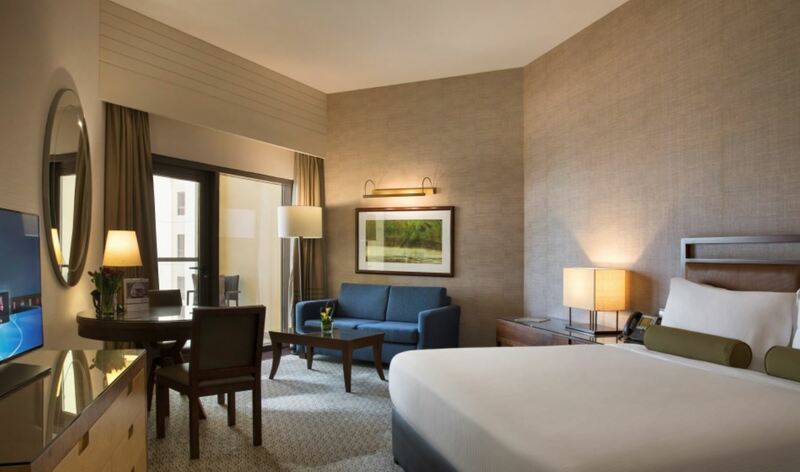 This Dubai hotel boasts 301 tastefully furnished guestrooms and suites equipped with bathtubs, fully-stocked mini bar replenished daily, complimentary tea and coffee making facilities, 32" LCD multi-channel TV, individually controlled air conditioning, Wi-Fi internet access, and in-room safe. Springing up from the Arabian Desert seemingly overnight, Dubai is an innovative city that goes out of its way to impress. This modern metropolis is all about extremes and firsts; it's home to the world's first seven-star hotel, the world's tallest building, the world's most iconic man-made island, and the world's largest shopping mall. 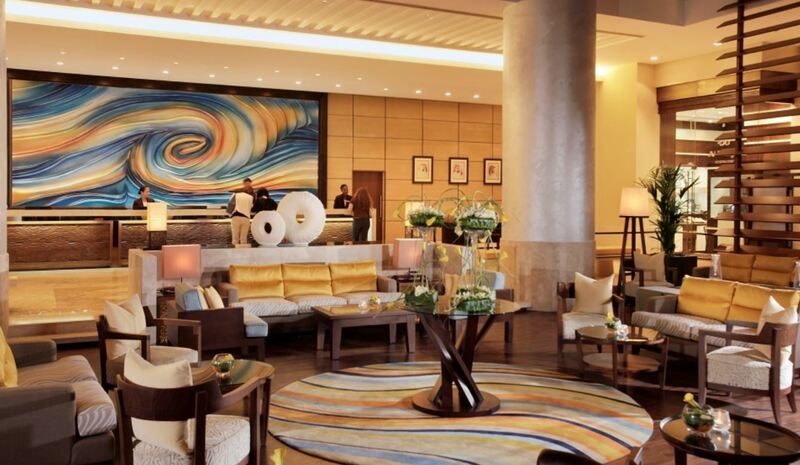 As well as all that extravagance, you can expect high levels of luxury and service at our selection of top notch hotels. In amongst the skyscrapers, you'll find bustling gold and spice souks that give you a taste of what Dubai was like before the boom. Take a traditional show cruise across the Creek, or head out of town on a spectacular desert safari. Add pristine beaches and year-round sunshine to the breathtaking cityscape and it's easy to see why Dubai is fast becoming one of the planet's most popular holiday destinations. Dubai is warm all year round, but it can get really hot in the height of summer. Visit from November to March for highs of around 25°C. One of the biggest draws to Dubai is the hot climate and gorgeous beaches, but there's plenty to do besides sunbathing. With its juxtaposed contemporary malls and ancient souks, Dubai's shopping scene is eclectic and second to none. There are more contrasts when it comes to Dubai's architecture; marvel at the landmark Jumeirah Mosque or take the elevator to the top of Burj Khalifa for staggering views of the iconic skyline and the gulf beyond. For thrills and spills, Wild Wadi Water Park and Atlantis The Palm have got it covered with their amazing aqua-based attractions. All those beaches mean there are plenty of water sports to choose from in Dubai - and you'll find first class golf courses inland. Think Dubai is all skyscrapers and no culture? Think again: visit Dubai Museum to learn about the colourful history of the city, take a traditional Dhow cruise in amongst the traders in the Creek, or head out to the desert for unbelievable scenery and a fascinating insight into the nomadic way of life. 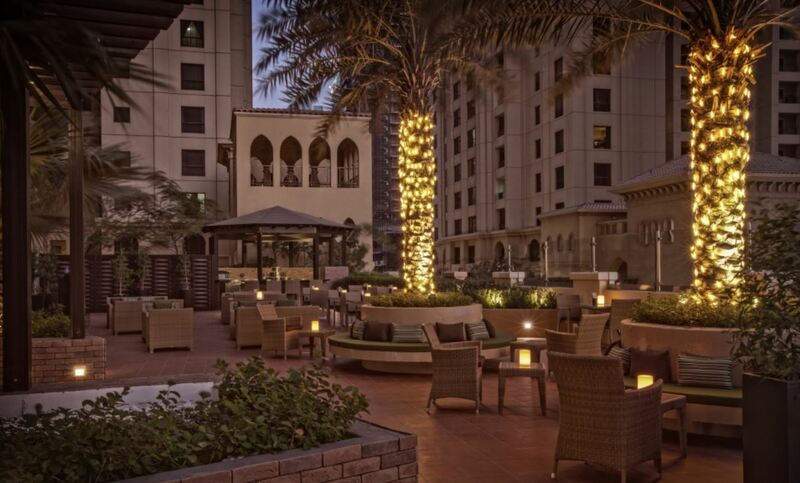 Dining in Dubai is a real treat, with everything from worldwide food to Michelin-starred restaurants to choose from. Many luxury hotels have a variety of in-house restaurants serving up international dishes from Japan, Italy, India and beyond. Don't miss the opportunity to sample the local aromatic cuisine that's shot with flavoursome spices. From glamorous, hotel-based bars to big name clubs like Buddha Bar, Dubai's nightlife scene is as varied as you'd expect from any modern city. Please keep in mind that alcohol consumption is only allowed in bars and on other designated premises, and that drinking on the street or in other public places is strictly prohibited. For an unforgettable evening, take a sunset tour to the desert and enjoy dinner in a Bedouin tent beneath the starry sky. Guide price is per person. Based on 4 people sharing for 5 nights on Bed & breakfast. Flying from regional airports. Year round departures. All overseas transfers included.